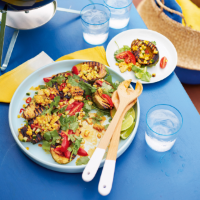 This quick and easy warm salad uses avocado and sweetcorn cooked on the barbecue for a great flavour. Perfect as a main course or as a side dish. 1. Preheat a griddle or barbecue to hot. Brush the sweetcorn with the olive oil and season. Place on the griddle or barbecue to cook for 10 minutes, turning frequently until charred and tender. Remove from the heat and allow to cool. Cut the kernels off with a sharp knife. 2. Place the tomatoes, cucumber, chilli and juice of 1 lime into a bowl and stir to combine. Stir in the corn kernels and set aside. 3. Toss the avocado halves in the juice of 1 lime, brush with 1 tbsp of the avocado oil, season with smoked paprika and some sea salt. Place cut-side down on the hot griddle or barbecue and cook for 3-4 minutes. 4. Remove from the heat, place on a serving plate, drizzle with the remaining avocado oil, scatter with the corn salsa and tear over the coriander leaves. Serve immediately with lime wedges and Tabasco sauce.